We would like to thank our local sponsors for their generous support. They all contribute to our local amenities and we encourage our members to use their facilities. As you can see they offer a wide range of products and services to meet a variety of needs. East Hotel & Apartments: 69 Canberra Avenue, Griffith. Studios, apartments and meeting facilities combined with a great location and excellent service; tel: 6295 6925; www.easthotel.com.au. Shop-Rite: Provides all your grocery and liquor needs, at 2 Barker Street; tel: 6295 0781. Your Discount Chemist, Griffith: At 12 Barker Street, over 11,000 products online at www.yourdiscountchemist.com.au; tel: 6295 6725. Every year in February/March we hold a raffle to raise the funds required to operate the GNCA, so we can interact with local residents to discuss issues of concern, raise the profile of the GNCA and lobby the Government. 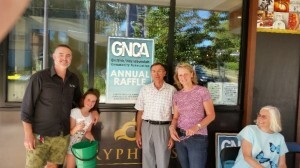 From left to right, Dan from Gryphons with daughter, GNCA President Leo Dobes, Vice- President Venessa Tripp and Secretary Deborah Price, at the drawing of the prizes. It is with great enthusiasm that we announce the winners of the 2018 GNCA raffle. Our annual raffle would not have been possible without the participation of our generous sponsors from our local Griffith shops. GNCA wishes to encourage our members and advocates to support our Barker Street colleagues. * Please contact us as the mobile phone number on the ticket is incorrect. If you know Susan, please ask her to contact Paul Russell on 0412 614966. You can always take the opportunity to tell the planners and your local MLAs what you think. It’s time to stop this ad hoc piecemeal planning in our suburbs. Write letters to the Editor of the Canberra Times or the Editor of The Chronicle or write to your MLAs.